FILE - Actor and comedian Bill Cosby exits the Montgomery County Courthouse after a jury convicted him in a sexual assault retrial in Norristown, Pennsylvania, April 26, 2018. Bill Cosby faced the start of a sentencing hearing Monday at which a judge will decide how to punish the 81-year-old comedian who blazed the trail for other black entertainers and donated millions to black causes but preyed on at least one young woman and perhaps many more. Cosby was the first celebrity to go to trial in the #MeToo era and could be the first to go to prison — perhaps for the rest of his days — after being convicted in April of drugging and sexually assaulting former Temple University employee Andrea Constand at his suburban Philadelphia home in 2004. "Obviously, the allegations are serious, and, except for his age and poor health, would normally warrant some jail time," said Samuel Stretton, a veteran defense lawyer not connected to the case. "I really think it's important that he spend some time behind bars," said Lublin, who said Cosby assaulted her when she was 23 in 1989. "At some point, he should acknowledge what he's done, and do the time for the crime." 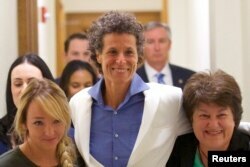 FILE - Bill Cosby accuser Andrea Constand, center, reacts after the guilty on all counts verdict was delivered in the sexual assault retrial at the Montgomery County Courthouse in Norristown, Pennsylvania, April 26, 2018. Monday morning, just a few hours before the sentencing hearing was to begin, Constand tweeted Ephesians 4:26, a Bible verse about letting go of anger: "Be wrathful, but do not sin; do not let the sun set while you are still angry; do not give the Devil an opportunity."